Claudia Ruitenberg was born and raised in The Netherlands. She first came to Canada in 1987 to attend the Lester B. Pearson United World College of the Pacific on Vancouver Island, and returned in 2000 for doctoral studies at Simon Fraser University. She divides her time between Vancouver and Salt Spring Island. 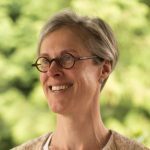 She is currently Academic Director of UBC Vantage College and President of the Canadian Philosophy of Education Society. She was Scholar in the Centre for Health Education Scholarship 2013-2017. In March 2014 Dr. Winston Thompson, a fellow philosopher of education from the University of New Hampshire, interviewed Claudia for his PIPEline series. You can listen to the audio-interview here. Ruitenberg, C. W. (Ed.) (2017). 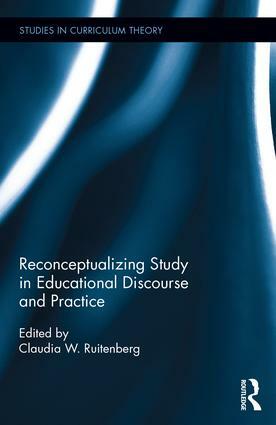 Reconceptualizing study in educational discourse and practice. New York, NY: Routledge. Ruitenberg, C. W. (Ed.) (2012). Philosophy of education 2012. Urbana, IL: Philosophy of Education Society. Ruitenberg, C. W. & Phillips, D. C. (Eds.) (2012). 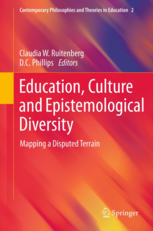 Education, culture and epistemological diversity: Mapping a disputed terrain. New York: Springer. Click here for an interview about the book. Ruitenberg, C. W. (Ed.) (2010). 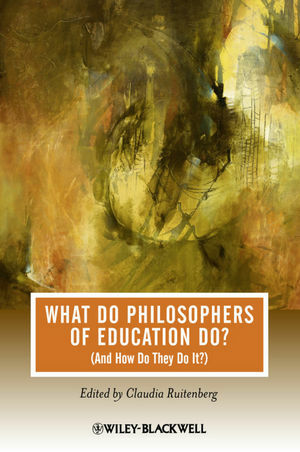 What do philosophers of education do (and how do they do it)? Oxford: Wiley-Blackwell. Ruitenberg, C. W. (2014). Multicultural epistemology. In D. C. Phillips (Ed. ), Encyclopedia of educational theory and philosophy (pp. 286-289). Thousand Oaks, CA: SAGE. Ruitenberg, C. W. & Vokey, D. (2010). Equality and justice. In R. Bailey, R. Barrow, D. Carr, & C. McCarthy (Eds. ), The SAGE handbook of philosophy of education. London: SAGE. Ruitenberg, C. W. (2017). Location, location, locution: Why it matters where we say what we say. Philosophical Inquiry in Education, 24(3), 211-222. Ruitenberg, C. W. (2016). Against a ‘life hack’ approach to art education. Canadian Review of Art Education, 43(1), 199-207. Ruitenberg, C. W., Knowlton, A., & Li, G. (2016). The productive difficulty of untranslatables in qualitative research. Language and Intercultural Communication, 16(4), 610-626. Ruitenberg, C. W. (2015). Performativity and affect in education. Philosophical Inquiry in Education, 23(1), 38-52. Piotrowski, M. & Ruitenberg, C. W. (2016). Liquid subjects: How news media educate political subjects in liquid modernity. Critical Studies in Education, 57(3), 342-357. Ruitenberg, C. W. & Towle, A. (2015). ‘How to do things with words’ in health professions education. Advances in Health Sciences Education, 20(4), 857-872. Ruitenberg, C. W. (2015). The practice of equality: A critical understanding of democratic citizenship education. Democracy & Education, 23(1), art.2. Ruitenberg, C. W. (2014). Physicians in philosophy of education: From cameo appearance to leading role. In C. Mayo (ed. ), Philosophy of education 2013 (pp. 146-154). Urbana, IL: Philosophy of Education Society. Ruitenberg, C. W. (2014). Hospitable gestures in the university lecture: Analysing Derrida’s pedagogy. Journal of Philosophy of Education, 48(1), 149-164. Ruitenberg, C. W. (2012). Learning by walking: Non-formal education as curatorial practice and intervention in public space. International Journal of Lifelong Education, 31(3), 261-275. Ruitenberg, C. W. (2011). The empty chair: Education in an ethic of hospitality. In R. Kunzman (Ed. ), Philosophy of education 2011 (pp. 28-36). Urbana, IL: Philosophy of Education Society. Ruitenberg, C. W. (2011). The trouble with dispositions: A critical examination of personal beliefs, professional commitments and actual conduct in teacher education. Ethics and Education, 6(1), 41-52. Ruitenberg, C. W. (2010). Conflict, affect, and the political: On disagreement as democratic capacity. In Factis Pax, 4(1), 40–55. Ruitenberg, C. W. (2010). Queer politics in schools: A Rancièrean reading. Educational Philosophy and Theory, 42(5-6), 618–34. Ruitenberg, C.W. (2010). Giving place to unforeseeable learning: The inhospitality of outcomes-based education. In D. Kerdeman (Ed. ), Philosophy of education 2009 (pp. 266-274). Urbana, IL: Philosophy of Education Society. Ruitenberg, C. W. (2008). Discourse, theatrical performance, agency: The analytic force of “performativity” in education. In B. Stengel (Ed. ), Philosophy of Education 2007 (pp. 260-268). Urbana, IL: Philosophy of Education Society.